Our three-day bacchanal in the Big Easy (a highly productive bacchanal, we might add) has ended, and FMC staff are back in D.C., where we're basking in the warm memories of another successful Artist Activism Camp and "Musicians Bringing Musicians Home" concert. Bet you wish you had been there! Well, maybe you were. . . if so, cheers! This year's retreat included such talented artists as Wayne Kramer (MC5), Jolie Holland, Jon Langford (Waco Brothers, Mekons), Saul Williams, Scott McCaughey (Young Fresh Fellows, Minus 5, R.E.M. ), Laura Veirs, Vijay Iyer, Erin McKeown, Bonerama, Al "Carnival Time" Johnson, Martín Perna (Antibalas, TV On the Radio, Ocote Soul Sounds), Mariam Adam (Imani Winds), Luke Reynolds (Pictures and Sounds) and Paul Sanchez. These musicians joined organizers FMC and Air Traffic Control in New Orleans to participate in strategy sessions about how to integrate activism and philanthropy into their musical lives and careers. They also took the time to tour local neighborhoods and visit with the city's notable musicians and community leaders. Then there was the concert, which was a doozy. 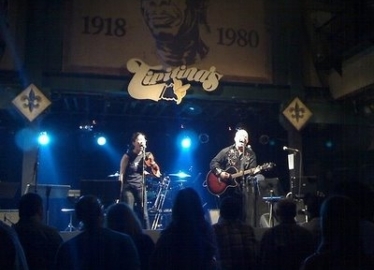 The all-star show took place on May 22 at Tipitina's Uptown and benefited Sweet Home New Orleans -- a non-profit organization that provides social services and economic development programs to musicians, Mardi Gras Indians, and other traditional New Orleans artists affected by Katrina. Check out our Events Coordinator Chhaya Kapadia's Flickr stream for a birdseye view of the action. Rumor has it the great Jon Langford was also prowling around with a flipcam; we'll post that video as soon as we determine its suitability for public consumption. You should also have a look at Chhaya's post on her own blog about her experiences in New Orleans. She's a true Artist Activism Camp veteran (or "Carnival Timers," as participants call each other), with five retreats and concerts under her belt. Hot damn!